* I received the following product in exchange for my honest review. I have a new to me indie brand to share with you today called O-My Jewels. Sophia the owner kindly asked if I was interested in trying out some of her polishes and I gladly accepted. I told her some of my color preferences and this is one of the colors she sent me to review. I must say, she figured me out pretty quickly because this color is definitely up my alley! 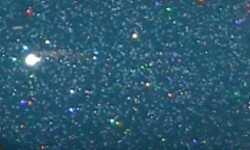 Sea Fan is a muted and dusty teal with scattered micro golden holo glitter. Color: I love dusty colors like this and especially blue and green ones. This is a beautiful and flattering color and I absolutely love the addition of the golden holo. You know me. I love cool toned colors with gold. Formula: This had an excellent and smooth formula. I used 2 coats above. Price: This is $7.25 on O-My Jewels website. This is a great price for an indie polish! Overall: I really enjoy Sea Fan. It's a beautiful color and I love the soft holo sparkle. This is a fairly simple color, but I really like that about it. It's not an over the top holo or a loud glitter. It's muted and has its own subtle touch of bling. I don't see a lot of colors like these being made anymore and I miss them. Not everything has to be in your face to be lovely and appreciated by me!